BHG's Favorite Museums, Attractions & Activities ~ Many are Free! Crystal Moll Gallery is a fine art gallery and frame shop. We are located in the heart of Federal Hill just a few blocks south of the Inner Harbor. This main street shop is home to the work of urban landscape painter Crystal Moll and the works of many local fine artists, with an emphasis on plein air work. In addition to paintings and prints, offered are note cards and art tiles. Join us for a reception and wine every 3rd Thursday from 6-8 p.m.
Moll 12 - Saturday, March 24th 4-6p. This fab group show will run through July 27th. Saturday, April 28th 4-6pm - Tim Kelly Painting Demo with Live Model. Join us for artist talks on Thursday, May 17th 6-8pm and Thursday, June 21st 6-8pm. Sale. Open to all! Artists and art lovers are welcome! the street. West Street parking garage, two blocks south of the gallery. First hour is free. illusionsmagicbar@gmail.com. Please arrive by 8:30pm for seating for the show. theme brings something special & different to Baltimore. Come for drinks & exciting magic! Welcome to Historic Fell's Point! April - December Saturdays 10-8pm & Sundays 11-5pm; Closed Mondays. Winter Hours TBA - Please Call for Winter Hours. Dates & Special Discounts. Cash and all major credit cards accepted. Highlights ~ Tours ~ Events ~ Exhibits ~ And More! Tours of Robert Long House - call for times, rates and reservations please. Visitor Center is open with guided tours by urban rangers - call or stop in for more information. Souvenirs, Gifts, Lectures, Museum and More! Ride the free Charm City Circulator bus, green route to Fell's Point. Fell's Point Visitor Center is a short walk through historic Fell's Point from the stop. Belgian block constructed Thames Street. garage at 1530 Thames Street. What Makes Fell's Point Visitor Center A Baltimore Harbor Guide Favorite, by »COMING SOON! Fell's Point Visitor Center at 1724 Thames Street. • Pick up your Baltimore Harbor Guide here! • Tours, Lectures, Museum and More! Plan to spend some time here! Federal Hill overlooks the Inner Harbor & is easily seen from Harborplace & the Waterfront Promenade. Enjoy a leisurely walk from the Inner Harbor to Federal Hill Park where the people of Baltimore celebrated the ratification of our Constitution. Later, Federal Hill was instrumental in protecting Baltimore during the Civil War. Be sure to see the Civil War cannon & the large replica 1814 US Flag. Today Federal Hill Park provides a great vantage point to view Baltimore and its beautiful harbor. While you are atop Federal Hill, visit Baltimore’s Historically Hip Federal Hill Neighborhood, named one of the Five Great American Main Streets! Restaurants, pubs, historic Cross Street Market (est. 1846) and a variety of shops and galleries along with Ravens Stadium and nearby museums make this 19th century neighborhood an interesting and enjoyable destination while visiting Baltimore's Magnificent Harbor. Walking the park grounds outside the fort is awesome & free! The walkway around the tip of Locust Point on the water's edge provides a beautiful view of the harbor & the Key Bridge. There is a visitor center & gift shop with free parking. To enter the star fort & experience the Ranger & Living History Programs, there is a fee. This late 18th century star-shaped fort is world-famous as the birthplace of the American national anthem. As the guardian of Baltimore's harbor, the valiant defense of Fort McHenry by American forces during a British attack on Sept. 13-14, 1814 inspired 35 year-old poet-lawyer Francis Scott Key to write "The Star-Spangled Banner." Fort McHenry was designated a National Park in 1925 and later redesignated a National Monument and Historic Shrine. Enjoy a delicious lunch, dinner or treat at our BHG Locally-Owned Favorites conveniently located along the way to and from Fort McHenry in Historic Locust Point. The Maryland Korean War Memorial lists the names of Maryland citizens who died in the Korean War, along with the names of Marylanders still listed as missing in action, on a large granite ring which also includes a history of the war & map of Korea. The US Flag, POW/MIA Flag & Maryland Flag are all part of this respectful memorial which honors our soldiers. Canton Waterfront Park & the Korean War Memorial are located along Boston St. & the harbor, between Potomac St. & S. East Ave. The park has lovely views of the harbor. Across the harbor is Fort McHenry & to your left you can see US Navy ships docked at the Clinton Street Marine Terminal. You can walk the Waterfront Promenade around the harbor to the park or from the park to the Inner Harbor. The park also has recreational facilities including a boat ramp & fishing pier. Nearby are several terrific resraurants that are BHG Local Favorites: Langermann's Southern Inspired Fresh Kitchen, Canton Dockside Authentic Maryland Steamed Crabs & Seafood, Edgar Allen Poe-themed Annabel Lee Tavern & Restaurant, & Jasa Kabob Authentic Indian Cuisine. The National Katyn Memorial in Harbor East commemorates the thousands of Polish Army Officers murdered by the Soviet Union as ordered by Josef Stalin in 1940. The statue by sculptor Andrzej Pitynski is 56 feet high including its base and was delivered from Poland to Harbor East in 2000. The term "Katyn Massacre" refers to the murders in the Katyn Forest and the Soviet prison camps. The atrocities were a failed attempt by Stalin to decimate opposition to communist rule in Poland. Three Polish officers on the monument represent the victims of the Katyn Massacre. When the Soviet Union collapsed in 1989, the head of the Communist Party finally admitted Soviet guilt. Get your Free copy of The Baltimore Harbor Guide at the Visitor Center (also at Baltimore hotels, businesses, Maryland Welcome Centers & many more locations). The visitor center has a friendly, knowledgable and helpful staff, an introductory movie highlighting Baltimore's history and attractions, and a new gift shop. 401 Light St. on the West Shore of Baltimore's Inner Harbor. 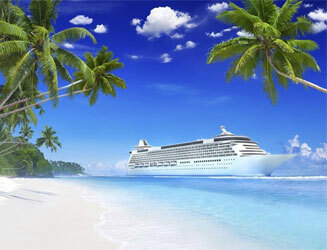 Cruise Maryland offers year round cruising to the Bahamas, Bermuda, Canada/New England and the Caribbean. Royal Caribbean International's Grandeur of the Seas and Carnival Cruise Lines' Pride sail out of Maryland. American Cruise Lines offers Chesapeake Bay cruises as well as Mid-Atlantic and East Coast Inland Passage cruises. 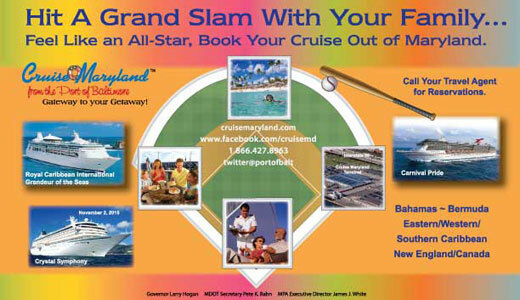 Cruise Maryland from the Port of Baltimore - Gateway to your Getaway! book your cruise for you nor do we have access to ticket pricing. Maryland website for detailed directions, parking rates, and other helpful information. Planning a visit to Baltimore and perhaps a cruise? 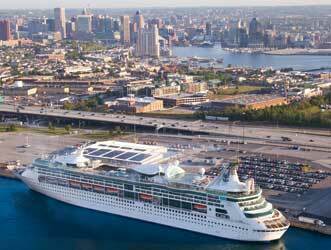 Combine your cruise with a few days visiting Baltimore. Sail out of the Port of Baltimore's cruise terminal, conveniently located off interstate 95. Cruise Maryland offers year round cruising to the Bahamas, Bermuda, Canada/New England and the Caribbean. On your way, you can see the gorgeous Chesapeake Bay, one of the most beautiful and bountiful estuaries in the world! Call your travel agent today to book your cruise. Please do not visit the terminal unless you are taking a cruise. This is not an attraction to go see. Cruise Maryland Terminal is located in Locust Point. ... High Value Giveaways and Much More! © Copyright 2015 Impact Associates | Baltimore, MD. All rights reserved. To BHG's Free Giveaways & Special Discounts!